The diary of my mother, Joan, from when she was a teenager in the lead up to World War II and after it began, taught me many things. 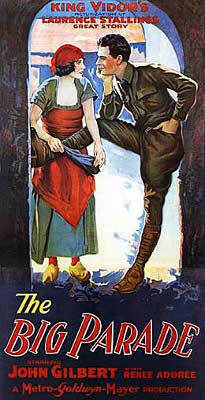 Among them, how present in her mind World War I loomed. Not even born when World War I raged, she grew up in a world dominated by the horrors of that conflict. It enters her diary at numerous points. I had the awfullest dream last night. I dreamt a war was begun and people were running about with brightened looks in their eyes. I was a boy and I knew I would have to be a soldier. I was afraid to go to war. I kept seeing trenches and mud and horror and pain and things—and killing people—and I was terribly scared inside. But I knew I would have to join the army anyhow because otherwise people would call me coward. I went to enlist and that’s all I remember. I figured I might have three months in a training group before I would have to fight. It was a terrible dream and I was so scared. That’s all I remember. 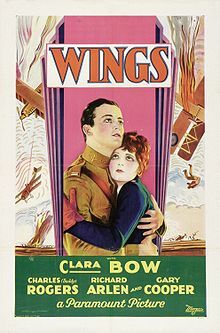 . .
Poster for the movie Wings from 1927. At this point, the image of war in people’s minds included trench warfare, as shown in movies like The Big Parade or Wings. Two years after the start of WWII in Europe and not a month away from Pearl Harbor, Joan has become more cynical. Here is an entry written when she still 18 years old.
. . . Day before yesterday was Armistice Day, if you can call it that—1941 A. D.. . . If we live, we’ll look back on these days and know, perhaps, either that they were not as important as we thought they were—or that they were much more important. God, in the heavens, look down on the world! . . . Today they finally finished repealing the Neutrality Bill. Arm our ships and send them into belligerent ports—drums beating louder now—we had a peace meeting at school day before yesterday—what the hell, what is Armistice? Time goes on. One of the bills of the 1930s that came from noninterventionist desires. With its repeal, the involvement of the United States in World War II was only a matter of days. War becomes real to Joan after Pearl Harbor. Here she is, age 18. The Japanese paratroops have captured Luzon in the Philippines and sunk two British ships, the Repulse and another near Singapore. Hitler speaks to Reichstag tomorrow. We just heard the first casualty lists over the radio. . . . Lots of boys from Michigan and Illinois. Oh my God! . . Here is a short film about the invasion of the Philippines by Japan. Here is a trailer of The Big Parade. Here are scenes from Wings.